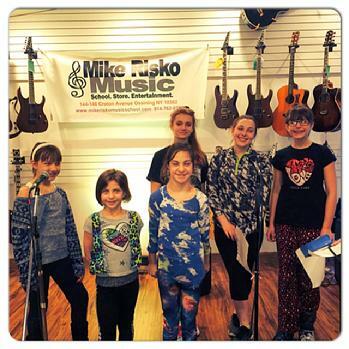 Have your child's birthday party at the Mike Risko Music School! In our super cool space, have a rock star birthday party! An enthusiastic Mike Risko Music School instructor will present a 45 minute interactive program designed to accommodate the ages of the party guests. *45 minute activity and one musical party host. *Invitations and thank you note. *Party host that sets up and cleans up. *A gift certificate for one free lesson for the birthday boy or girl. The Mike Risko Music School is available for Rock Star parties on Fridays from 5-6:30 or Saturdays from 2-3:30 or 4-5:30. If there is another time you would like to request for a party, please inquire and we will try to accomdate you. For availability, fees and to book a party, please contact us. Remember to book your party early in order to reserve time and day of choice. Each birthday party guest will get the rock star treatment as he or she is treated to Happy Birthday to live music and cake in our party zone. Kids of all ages love our rock star birthday parties! Party activities are held in our "Rock Star Zone" which is an awesome stage with sound equipment and lights! Birthday guests are treated like rock stars and get to perform for an audience at the end of the party. Our party room (or what we call our "green room" for parties) is bright and open and can accomodate all your guests comfortably. Parents can wait in one of the comfortable waiting areas at the music school or they can shop many of the stores in our neighborhood. With a professional rock vocal coach, party guests will warm up their voices using the coolest pop/rock vocal warm ups, just like the stars use! They will get to use a rock star mic and will learn to sing one or two of the most popular pop, rock or Broadway tunes. They will rehearse their song(s) and stage it in preparation for their show at the end of the party which they will perform for their parents. This party is great for ages 4 through adults. You can choose your own song(s) or we can guide you. You can choose either pop, rock or Broadway style songs. Rock out on different instruments like the guitar, piano, drums and more! Learn an easy tune and play it for the parents at the end of the party. This party is great for ages 7-adults. For both parties, rock stars take a break from rehearsing to enjoy birthday treats brought by the party host in our "green room". Parents are invited back 15 minutes before the party ends to get a seat and video the show which takes place in our rock star zone. They can take pictures of their rockers on our red carpet in front of our step and repeat. There is no better way to spend your birthday! No musical experience necessary for any of our parties! Rockin' Musical Tots: Try different musical instruments, musical games, sing songs and top off your adventure with a musical story! Ages 2-5 love this party! Bring cake and other party treats for your guests. We wrap up the party with an age appropriate craft. During a Rock Star Vocal party, singers get to sing Rock Star Vocal exercises! 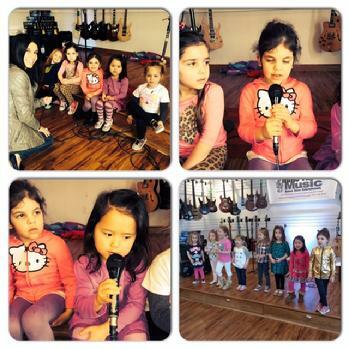 Kids love to learn about musical instruments at our Rockin' Musical Tots birthday party! If you are interested in a birthday party, fill out the information below and a representative will get back to you as soon as possible! How old is the birthday boy or girl?